A Seneca Falls man was arrested at the Seneca County Correctional Facility and charged with criminal mischief in the fourth degree after an incident at the facility. The incident occurred when Samuel J. Eckert, 28, of Seneca Falls was confined as an inmate at the Seneca County Correctional Facility on September 26th around 2:55 pm. Eckert had been arrested earlier on two separate occasions after a domestic incident in the Town of Seneca Falls. He will answer all of the charges at a later date. 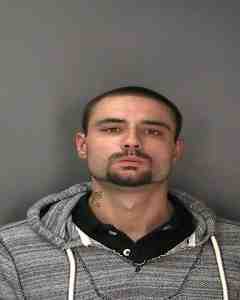 On Saturday September 24th at 7:52 pm the Seneca Falls Police Department arrested Samuel J. Eckert, 28, of Seneca Falls. The arrest stemmed from a domestic incident where Eckert allegedly kicked a locked door in causing damage to the door frame. Eckert was charged with one count of criminal mischief, a Class A misdemeanor. He was arraigned in the Town of Seneca Falls Court. The judge issued an order of protection and released Eckert on his own recognizance. Later that night at 12:47 am — on Sunday, September 25th the Seneca Falls Police Department arrested Eckert a second time. The arrest stemmed from the earlier reported arrest where Eckert was arrested for criminal mischief during a domestic dispute. After the Seneca Falls Town Court released and issued an order of protection mandating that Eckert have no contact with the protected party — he proceeded to make contact with the protected party. He was charged with one count of criminal contempt in the second degree. He was processed and arraigned in the Town of Seneca Falls Court. Eckert was committed to the Seneca County Correctional Facility in lieu of $750 cash bail or $1500 secured bond. He is due back in court on October 12th at 9:00 am to answer the charges.